Not since the pairing of Bialystock and Bloom has there been a theatrical partnership to match that of Mel Brooks and Susan Stroman. He’s an irreverent comic genius who for 70 years has taken no prisoners in his mocking of life’s stereotypes and injustices while she is one of the most perceptive and assured director/choreographers of her generation. And so it is that their latest collaboration Young Frankenstein, recently arrived from Broadway to open at London’s Garrick Theatre, is another triumph. Like The Producers before it, Young Frankenstein hails from a Brooks movie of some 40 years earlier with the veteran writer/director reframing the comedy-horror flick around his own composition of words and music. And much like Dr Frankenstein’s eponymous creature, Brooks (together with Stroman) has re-animated his story into exceptional musical theatre. If Sunset Boulevard is a sincere tribute to the romance of post-war Hollywood, then Young Frankenstein is an as-loving parody of the same time and place, but played for laughs. Snowflakes be warned, there are no “safe spaces” in this show as Brooks makes fun not only of cinematic genres, but also, and mercilessly, of men, women and for good measure exhumed corpses too. The jokes may be as corny as they are smutty, but Brooks knows just how far to dig in mining this rich and timeless seam of humour, throwing political correctness to the wind. 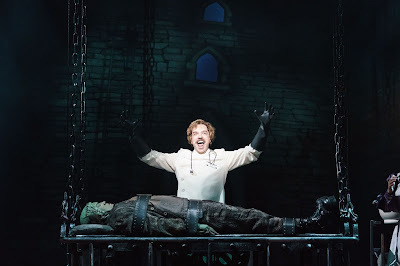 The plot (very) loosely follows the classic story, with Hadley Fraser as the fine-voiced young Dr Frankenstein leaving his slightly matriarchal fiancée Elizabeth played by Dianne Pilkington and setting off from New York (aboard the HMS Queen Mary Shelley, geddit?) to travel to his infamous grandfather’s castle in Transylvania. Ross Noble is Igor, the hunched assistant, Lesley Joseph plays Frau Blucher an older woman with a sinister past, while Summer Strallen is Inga whose character is largely a recreation of The Producers’ Ulla. Noble’s talent lies in stand-up comedy - though he applies himself brilliantly to the scripted confines of Igor’s ineptness. Joseph however is quite simply an old-school comedy master. She works the room and with her big number He Vas My Boyfriend offers up a gloriously pastiche of Marlene Dietrich. Strallen’s Inga sends the comedy straight back to the 1970s - gifted in song, dance and performance, her turn defines the cliché that Brooks has created for her. There’s eye-watering stuff from Patrick Clancy who doubles up both as the village’s police Inspector as well as a Hermit who befriends the monster. Clancy is also a talented pro who’s worked with Brooks before - his timing is spot on, with slapstick that is as hilarious as it is offensive. Notwithstanding the occasional lapse in pace, Stroman’s staging is inspired. Act 2 may contain some wittily brilliant tap routines that spoof Top Hat delightfully, but the first half’s number Hang Him Til He’s Dead sees the pitchfork-waving mob of villagers choreographed into an embarrassingly joyous hangman’s dance. And as for the horses that haul Dr Frankenstein’s cart to the castle, never has the equine form been staged or suggested with such ingenuity and comedy. Perhaps the biggest accolade of the night is due to Shuler Hensley who plays The Monster. Only rarely seen on this side of the Atlantic (he was last in London in the 90s for an Olivier-winning turn as the monstrous Jud in the National Theatre’s Oklahoma) Hensley created The Monster on Broadway before touring with the show and he breathes a life into one of the canon’s most curious characters. His Monster has to evolve from being of virtually zero-intelligence, to a creature that’s far more sophisticated. To reveal any more would be to spoil - suffice to say that Hensley masters the transformation magnificently. As this review is published, the producers have announced that the run is extending into late 2018. Hurrah! Young Frankenstein is a fabulous night out.